On Tuesday 9th October, Roger Crabtree was taking advantage of the good weather and was sailing his yacht Good Hope in Plymouth Sound when he suffered a stroke. He was able to send a Mayday and assistance was promptly provided by other boats, the RNLI and the Ambulance Service. Sadly however, he died in hospital two days later. Roger had the strong belief that experience on a traditional sailing vessel can help people of all ages, including adults with individual personal challenges. He was a person who put beliefs into action so, on retiring as a GP in 2006, he commenced a search for a suitable vessel. He eventually found one in the Mediterranean. She was built of teak in India in1929, a sturdy craft but needing restoration, Her name was the Latin word for teak – Tectona. He bought her and in 2008 with Barbara sailed her to Plymouth. 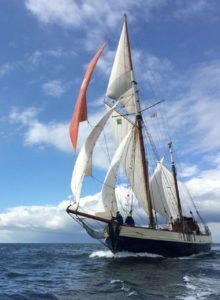 It transpired that Tectona has a close affinity with the port as she had been the sail training vessel for the Plymouth School of Navigation in the 1960’s and 70’s. The qualities for which made Roger so memorable were his zest, cheerfulness, his empathy with others and enthusiasm which he shared by word and deed. The word “inspirational” can only be rightly used about a few people; Roger truly was inspirational. We have had the benefit of a close relationship with Island Trust, a charity of high reputation for providing sail training for young people, that has safely managed Tectona since 2009. Roger was very keen to develop the next phase of the Tectona project. It is poignant that just as we are setting up Sailing Tectona CIC to take over her operation, Roger passed away. We are determined that Roger’s vision will be carried forward as a legacy to an unforgettable man.